In August hundreds of protesters rallied in front of the Israeli Embassy in Cairo. 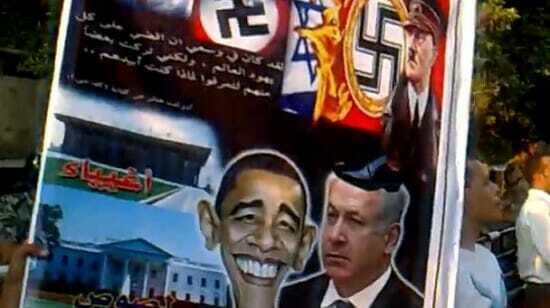 Violent anti-Semitism is on the rise in the Middle East following the Arab Spring protests in 2011. The paper provides a lengthy list of anecdotal evidence. In Libya, it points at rebel claims that the mother of longtime ruler Muammar Gaddafi was Jewish as a way of defaming the slain dictator. In Syria, it cites insults made by the embattled government of Bashar Assad calling opposition forces “an army of donkeys in the service of the Mossad.” And in Egypt it says Muslim scholars have issued edicts forbidding believers to sign agreements with “monkeys,” referring to Jews. The study, however, does not contain numerical data. Eran Sidis, a spokesman for Edelstein, said figures supporting the thesis of the report will be released by the Kantor Center in April. Edelstein said the report was a sad reminder that anti-Semitism is still alive and well in 2012.